Part wild west art pilgrimage with unlikely unrugged city girl. 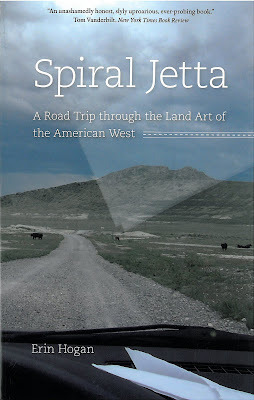 Part Art History and Aesthetic Theory discussion with striking insight into land art pieces of Utah, Nevada, Arizona, New Mexico, and Texas. Hogan is funny, neurotic (in a charming, self-deprecating, nasally Woody Allen sort of way), and insightful. 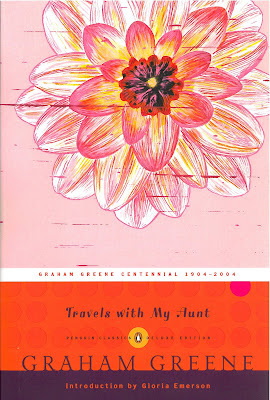 Auntie Mame with Attitude, a coming of age novel for the Middle Aged, a kaleidoscope of intrigue, suspense, a thriller for those who love to think while they are laughing and laugh while they are thinking, a book you will enjoy re-reading. Roller Derby comes to the rescue for Bliss Cavender, a small town Texan who's sick of participating in beauty pageants. 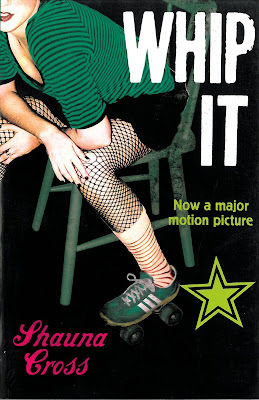 This is the basis for the recent film, Whip It, starring Juno's Ellen Page. I think I first read about HeLa cells in my random science readings when I was a teenager. 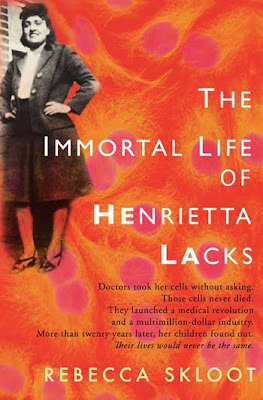 I remember being fascinated (as I still am) with the idea of an immortal human cell line and the fact that the cancer lived on even after the death of Henrietta Lacks. But there was a huge blank in the story—I couldn't find any information about the woman herself. In 1951, a sample from Henrietta Lacks' cervical cancer was taken without her consent or knowledge and cultured. It became the world's first immortal human cell line and one of the most important research tools in medicine. The cells helped develop the polio vaccine, point out the causes of cancer, and lead the way to cancer cures. Her family found out about the cells 20 years after Henrietta's death. They were devastated by the revelation. They had just read about the Tuskegee Syphilis Study, and the news of their mother and wife's living cells conjured a similar horror in their minds. Even later they found out that millions of dollars have been made off of HeLa, while most of her family could not (and still cannot) afford health insurance. Rebecca Skloot spent 10 years getting to know the family and researching Henrietta's life. She has written an amazing work in The Immortal Life of Henrietta Lacks, detailing Henrietta and her descendants' lives. She brings to life the family, their emotions, and the science in her wonderfully clear and fascinating writing. Finally, Henrietta's story is told. I Heart Books Sale! Feb. 4-6! 25% off new books! 50% off used books! 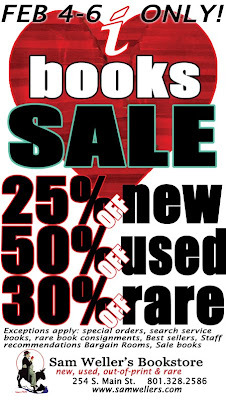 30% off rare books! Some exceptions apply. 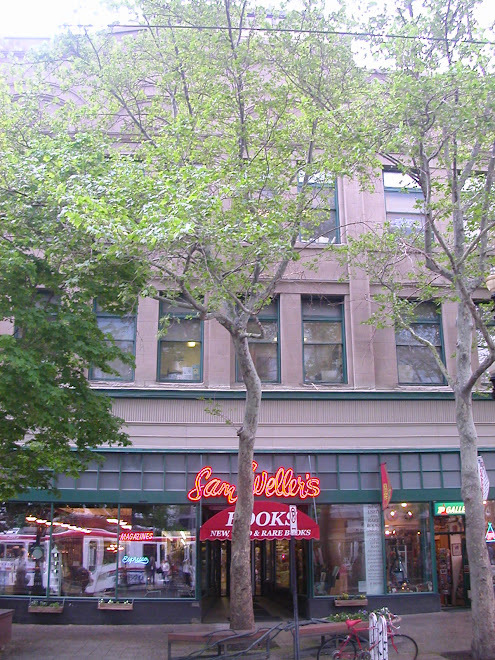 Sale does not include special orders, staff recommends, best sellers, and bargain room books. Does not combine with any other sales or discounts. Every other month Sam Weller's buyers choose a book that they are particularly excited about. We feature it all over the store and discount it 20%. 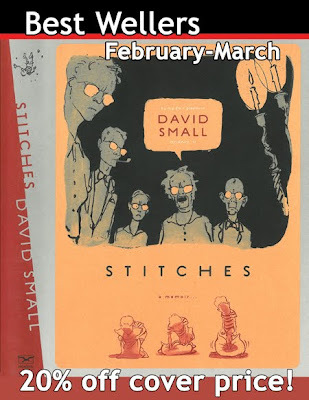 This month's selection is Stitches by David Small. I’ll start by saying I don’t enjoy most memoirs. The ones I have enjoyed, most of them at least, have been in graphic format. Illustrator David Small presents the story of his childhood with images and few words making Stitches a very quick read. The black and gray images flow so smoothly and are so interesting in their unconventional composition that it feels as if you’re watching a silent movie as you flip the pages. Small’s father was a radiologist and, before the knowledge of how dangerous x-rays could be, exposed him regularly to heavy doses of radiation to treat his respiratory problems. A large lump formed on the side of Small’s throat, but he was told he was fine and not to worry. When Small woke up from surgery at age fourteen to find a vocal cord removed and a line of stitches down his throat, he realized things were much worse than he had been led to believe. This unique coming-of-age story is one that will stay with you, even if it’s just to remind you that maybe your family isn’t as bad as you think.